(Nanowerk News) Researchers at Heidelberg University have devised a new way to study the phenomenon of magnetism. Using ultracold atoms at near absolute zero, they prepared a model that simulates the behaviour of electrons in a solid, which enables the investigation of magnetic properties. The findings of the team led by Prof. Selim Jochim of the Institute for Physics are expected to contribute to a better understanding of the fundamental processes in solids and lead to the development of new types of materials over the long term. The results of their quantum simulation research, conducted with physicists from Hannover and Lund (Sweden), appeared in the journal Physical Review Letters ("Antiferromagnetic Heisenberg Spin Chain of a Few Cold Atoms in a One-Dimensional Trap"). Magnetism has been known for over 2,000 years, and was used early on to develop the compass, whose needles align themselves with the earth's magnetic field. Nonetheless, the microscopic causes of magnetism were not understood until the development of quantum mechanics at the beginning of the 20th century. One of the most important discoveries was that electrons in a solid behave like tiny compass needles that align themselves with an external magnetic field and also affect each other. The magnetic properties of a solid depend on how adjacent electrons arrange themselves relative to one another. For instance in ferromagnetic substances such as iron, all electrons point in the same direction. In antiferromagnetism, however, each electron points in the opposite direction of its neighbour. The Heidelberg physicists used very few atoms, namely four, for their quantum simulation. “Precisely preparing such a small number of atoms is a major technical undertaking. It allows us, however, to control the state of the atoms with extreme precision,” explains Simon Murmann, Prof. Jochim’s doctoral student in charge of the experiments who has just completed his thesis on the subject. 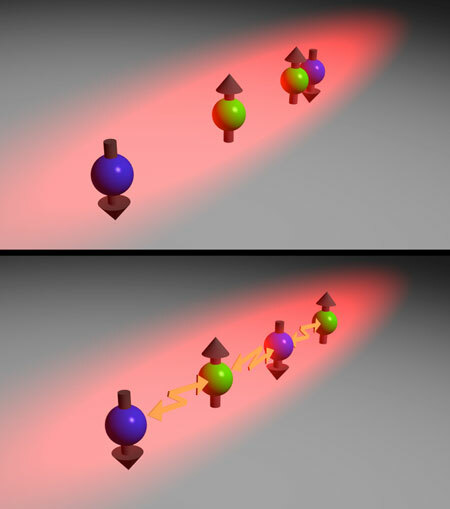 The atoms are held in a laser light trap that allows movement in only one dimension. They are subject to virtually the same physical laws as electrons in a solid, but the physicists are able to precisely control the interactions of the atoms. Initially, there is no interaction between the atoms. In this state, they can move freely inside the trap without any fixed arrangement. But when we introduce increasing repulsion between the atoms, they can no longer pass one another and end up forming a chain. Each atom in the chain points in the opposite direction of its neighbour, one up and one down. This brings about an antiferromagnetic state,” explains the Heidelberg scientist. This observation is of great interest to the researchers because antiferromagnetism is connected to physical phenomenon that could lead to far-reaching applications. “Superconductivity, i.e. the lossless conduction of electricity, was observed in antiferromagnetic materials at relatively high temperatures of only minus 135 degrees Celsius,” continues Selim Jochim. “We hope that our experiments will contribute to the understanding of the fundamental processes in solids. One vision is to develop new materials that will remain superconductive even at room temperature”.